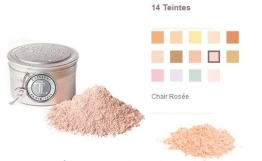 T.Leclerc Poudre Libre Dermophile 25 g is a powder that can unify and matify the complexion in a few gestures. This light and airy powder helps to unify your complexion and lets your skin breathe. Even after application of the powder, your skin remains supple, and is made up for the whole day. You can choose the shade that suits you among the 11 colors proposed. Applying to the puff: Take the powder with the puff. Crush the puff in the palm of your hand to fix the pigments on it. Then generously powder the face with taps or rocking movements from the bottom to the top of the face. Remove the excess powder with the big brush. Brush application: Take the powder with the brush. Crush the brush in the palm of your hand to fix the pigments on the brush. Finally apply the powder in circular motions all over the face without neglecting the neck and back of the ears to avoid a "mask" effect. Indication: Makeup of the complexion. Talc, Oryza Sativa Starch (Oryza Sativa (Rice) Starch), Fragrance Fragrance, May contain: CI 77947 (Zinc Oxide), CI 19140 (Yellow 5), CI 77491 (Iron Oxides), CI 77492 (Iron Oxides), CI 16255 (Red 102 Aluminum Lake), CI 73015 (Blue 2), CI 15850 (Red6), CI 42090 (Blue 1), CI 15985 (Yellow 6), CI 75470 (Carmine), CI 77742 (Manganese Violet), CI 47005 ( Yellow 10), CI 45380 (Red 21), CI 77288 (Chromium Oxide Greens), CI77007 (Ultramarines), CI 73015 (Blue 1 Aluminum Lake).